Have you ever looked in your bank account and wondered where your money went to? Why does money have the bad habit of disappearing so fast!? I’ve been there too! I hated the feeling of living with a tiny bank account – dreaming of a life with less financial worries. I was determined to find ways to save money – mainly to pay down student loans and start an emergency fund. I had to re-evaluate my spending habits, bills, student loans, and lifestyle choices to find the main culprits of my ever-dwindling bank account. First of all, I took the steps to create a successful budget. 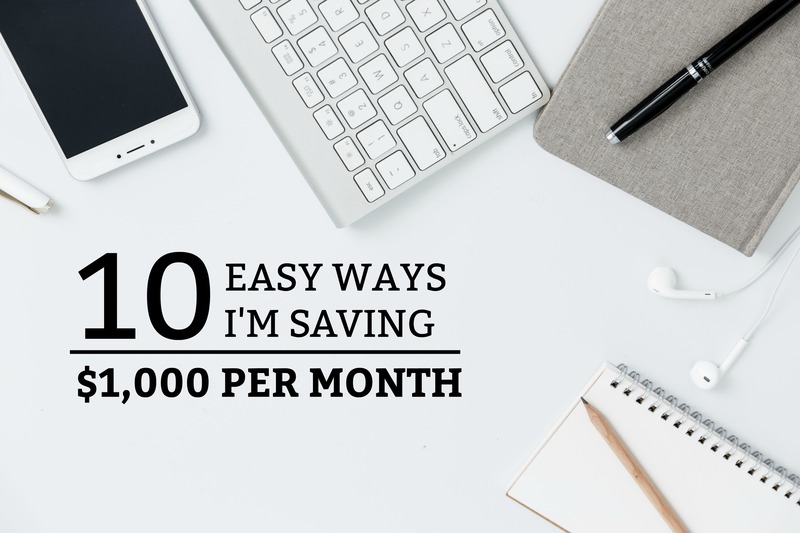 To my surprise, I found quite a few areas where I could save and make extra money and they were worth a ton of savings – around $1,000 per month. Below are the money saving tips that I learned! I didn’t feel that I was eating out very often, but my small food and drink purchases actually added up very quickly! A few Starbucks drinks, fast food, weekend dates, work lunches, and a few “I’m lazy and I don’t want to cook” meals all added up VERY QUICKLY! These habits alone were costing me over $250/months. I started making my own coffee in the morning, taking home-made lunches to work, cut out most fast-food, and started eating at home before going out with friends. I also went food shopping more regularly, so I wouldn’t have an excuse to eat out! Not only did I save money, but I lost a few unwanted pounds. Bonus! Besides watching the nightly news and a few of my favorite TV programs, I didn’t really watch cable TV. I only had it because it was the “normal” thing to do and I hadn’t lived without it before. This cancellation saved me $120/month ($1,440/year)! After cancelling, not much changed because I still had a few FREE channels (thanks to ). These antennas are very affordable and typically provide you with access to 30 channels and the main 4 networks. Since I already shared a Netflix account with my family and had Amazon Prime, I was not deprived of quality entertainment! I was never a crazy spender, but I did LOVE new clothes. However, even shopping the sales racks and discount retailers like Marshall’s and TJ Maxx can take a toll on your pocket book! I decided to start creating new outfits with the clothes that were already hanging in my closet. And I wasn’t allowed to go “window shopping” for clothes because I always somehow found an unexpected sale! Breaking this habit wasn’t too difficult, but I did have days when I just really wanted a new pair of jeans! I was able to save around $100 each month by cutting back on clothes shopping and giving myself a set allowance for these purchases. During college, I had the cheapest phone possible and used Virgin Mobile’s pay-as-you-go program for $25/month (because I couldn’t afford the service some months.) After I graduated, I started travelling for work and needed a more reliable phone and coverage. I upgraded to an iPhone and paid $90/month for unlimited talk, text, data, and international calling with Verizon. After researching better cellphone plans, I found a deal with T-Mobile for $30/month if there were 4 people on the plan. A few family members jumped on board and I was able to cut my monthly cellphone bill by $60. Now, I can’t imagine paying that much for a cellphone plan! With so many discount cell services out there, there are countless options for a more cost-effective route. I received my monthly internet bill and it stated that my service had gone up from $35 to $60/month. Although I had signed up for a one-of-a-kind deal that lasted only one year, I did not expect it to go up by that much! This was an extra $420 per year! Some people may tell you not to negotiate unexpected bills, however this is one of the common financial tips you should never take. I called up my service provider and asked them if they would be willing to lower the price, since it had gone up so drastically. I was very polite – a key element in my style of negotiation. After being told that they could not lower the rate, I let them know that I would have to cancel my service because I was not willing to pay that much per month (while letting them know that I would stay if they were able to lower the monthly cost). I was forwarded to a manager, who lowered my monthly rate down to $45/month. This negotiation saved me $15 per month. Insurance companies have a bad habit of increasing your rates even when you have a perfect driving record. A few months ago my Geico premium suddenly increased by $45/month. I shopped insurance providers and found a much better offer. Pro Tip: Research insurance rates once every 6 months. You can usually find a better deal with the same benefits. I had some home décor and clothing that I never used, so I decided to sell it. I put it up on Craigslist and a few local buy-and-sell Facebook Groups. I was able to earn around $50/month, simply because I decided to get rid of some belongings that I had no use for. It took some work on my part, but it was honestly a very easy way to earn some extra money! I was surprised to find out how much people were willing to spend on trendy furniture. Since I enjoyed refinishing old furniture, I decided to flip a few pieces and see if they sold. I bought a few second-hand side tables, coffee tables, and dressers and purchased some sand paper, paint, and brushes from Home Depot and went to work! I put them up online and earned over $200 per month in profit simply from repainting these pieces in a trending color! You should give this one a try – even if it is just some small furniture pieces. I had a knack for cutting hair, so I sold my services for $10/cut! I was able to make over $60/month just cutting some hair on the weekends. If you have a gift, you can monetize it! I have tutored students and given piano lessons – all because I had a gift for teaching those subjects. I made a food list and I started eating before I went shopping. Yes, you do buy more unnecessary and unhealthy food if you are hungry! I bought a magnetic shopping list for my fridge and would write down the items that I needed – as I used up the food that was already in my pantry. Once I got to the grocery store, I was not allowed to deviate from the shopping list. I cut back on snacks and unnecessary food items, which in turn helped me to lose weight. Don’t believe the lie that healthy is more expensive! It doesn’t have to be! I also shopped at a discount grocery store and saved a TON of money. Overall, I was able to cut down my monthly grocery bill by $100. Pro Tip: Shop the outside aisles of the grocery store. This is where you will find all the fresh and health foods like fruit, vegetables, dairy, and meat. If you sit down and evaluate your spending habits, you can always find a few areas that you can cut back on, negotiate, or earn more money. However, always start your financial journey with creating a successful budget. It is never too late to get your finances back on track!